For more videos about the program, you can go here. This weekend was a momentous occasion. The above image of a healthy fifteen inch brook trout caught by an angler of Canadaway Creek reflects what a DEC biologist feels could be a brookie that has returned from Lake Erie! The biologist felt that the fish caught in the lower section of the stream, about two miles from Lake Erie, was too healthy and well fed to have been in the stream since October. October was when our SAREP/4H Youth Fly Fishing Program had put in brook trout in the upper sections of the stream around eight miles from where the fish was caught. When I first moved into the area in 1989, I had heard old timers mention how their fathers used to catch brookies in Canadaway Creek. Brook trout (actually a char) are the only true native trout to the Northeast and have been in its streams since the ice ages. (The brown trout came from Germany and the rainbow Trout came from the Northwest and both were distributed throughout the United States in the late 1800s.) Brookies are the most fragile of these trout species and are the first to feel the effects of high water temperature, agriculture, riparian condition (erosion/sedimentation), competition from non-native fish species, and urbanization. These factors have greatly reduced or have eliminated the brook trout in nearly half of the watersheds in their native range. The vast majority of historically occupied large rivers no longer support self-reproducing populations of brook trout. In 2006, The SAREP/4H Youth Fly Fishing Program started reintroducing brook trout into Canadaway Creek after not having brook trout in its waters for over a hundred years. The efforts were first funded by sales of flies tied by the youth from the program and by donations but a few years ago, the Brook Trout Reintroduction Program was funded by Doug Manly and Patagonia’s World Trout Fund. 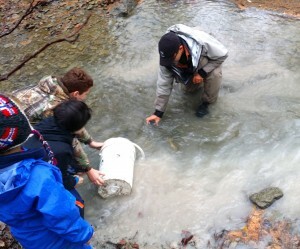 With the support of the DEC’s electroshocking efforts and the Whispering Pines Hatchery, we have been able to refine our stocking practices to match the hatchery’s cold water temperatures by distributing the fish near springs in the headwaters, by introducing the fish after fishing season and by purchasing older brook trout who were ready to spawn as soon as they entered the stream. These changes reflected a more effective use of our funds and energies and dramatically improved the brookies chance to reproduce and prosper. Our hopes has always been to create an opportunity for the fish to survive and reproduce in Canadaway. We hoped that one day they could survive the trek into the lake and then return to spawn. The image at the top of one of the two brook trout landed is a very small sample of evidence but when it is added to electroshocking fish surveys and other anecdotal evidence over the years from fisherman, the overall picture is encouraging that the SAREP/4H Youth Fly Fishing Program’s efforts have made a positive change in having brook trout survive, prosper and swim again in Canadaway Creek. Orvis’s Picture of the Day! 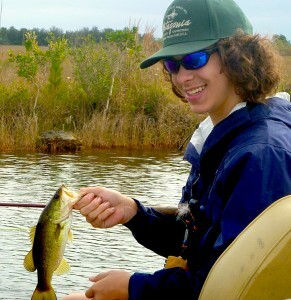 Here’s a link to the Orvis site and of the picture they selected as the picture of the day. 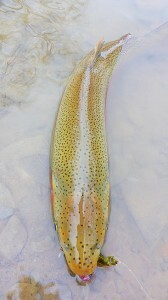 The images was taken on a local stream on a wonderful day of leisurely fishing with a friend. 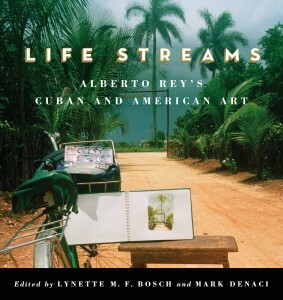 Here’s a link to seeing a little more recognition about the recent publication about my work. While on a recent guide trip, I found this odd looking creature that was later confirmed as a mudpuppy. 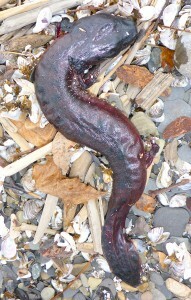 The common mudpuppy is a species of salamander in the genus Necturus. Fall breeding activities take place in the shallow waters of lakes and streams at depths ranging from only decimeters to several meters beneath rock slabs, logs, or planks. Arnold, an old steelhead client and friend who retired after working 34 years for the Miami Herald. 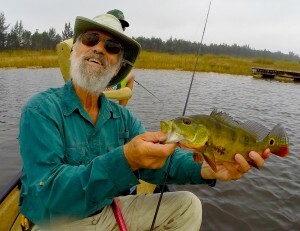 He is presently a fishing columnist for the Waterfront Times in Fort Lauderdale, FL. Here’s a new video from last week’s trip to visit my folks in Miami, Florida. This fall, the S.A.R.E.P. 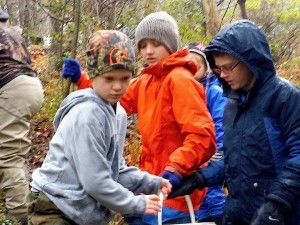 Youth Fly Fishing Program again performed its annual brook trout stocking into the Canadaway Creek in Western New York. The efforts of parents, community members and children foster a sense of stewardship that will protect the local stream for present and future generations while they also learn a bit about their home waters. The brook trout that are put into the stream are ready to spawn and our hopes are to create a newpopulation of the species that will survive long term in the stream. Initial reports are positive andencouraging as local residents have found brook trout moving into smaller tributaries to spawn and electroshocking reports have found large healthy brook trout surviving the hottest months of the year. The stocking is financed through grants and the generous support of a private donor, Doug Manly. Here’s a short video of our latest efforts. A fishing we will go! In the summer of 2014, my thirteen year old son and I met two old friends from Pittburgh and we flew out to Montana to fish the West and East Fork of the Bitterroot River as well the rivers in and around the Lamar Valley in Yellowstone Park. The following link on Gaia GPS shows you everywhere we we went on the road and in the stream with a few photos to mark special places we encountered. The following video documents our adventures on the West Fork of the Bitterroot River. It was our first trip to this river but by the third day we were experiencing moments that would become life-long memories.